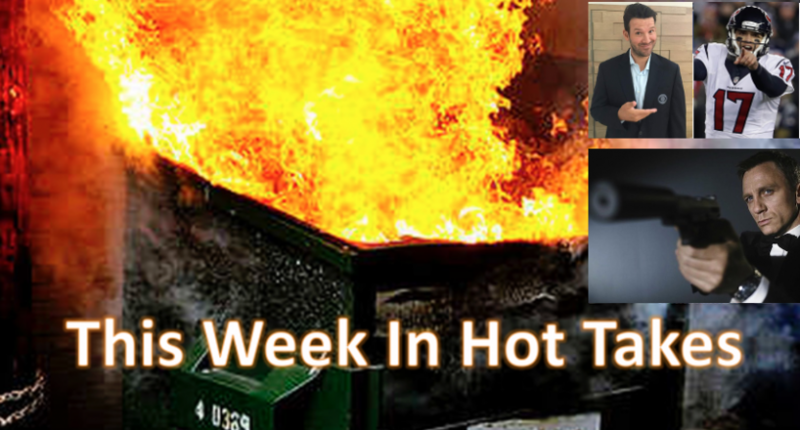 This Week In Hot Takes: Mike Parry thinks "James Bond shouldn't support Liverpool"
Welcome to another edition of This Week In Hot Takes. Here’s a look at the hottest sports media takes from March 31-April 6. Well, throw another extraordinary ending to an extraordinary game on the ol’ Can’t-Miss/Missed-It heap, a growing pile caused by sports’ addiction to TV money. The historic buzzer-beating OT end to the historic UConn women’s winning streak at 111, was widely lost to at least half the country’s population as it began here Friday at 10 p.m., and ended Saturday morning at 12:16. Fittingly, it was played on and for ESPN, where significant games played by Eastern Time Zone teams now regularly go to their midnight deaths, surrounded by friends and family — those still awake — but otherwise alone. To be honest, I saw the end of regulation and OT only because I awoke in time, thus performing a Half-Mike Francesa — honest enough to admit I fell asleep. But that was less a matter of luck than of an aging bladder. Well, at least Bayless is right about the “tale told by an idiot” part. Debating whether Romo’s a Pro Football Hall-of-Famer is absolutely valid, and there’s a case to be made that he’s not, but overlooking all the highs of his career this way is remarkably dumb. It’s also a stance shared by Bayless’ former debate partner, as we’ll see in the next entry. Judging quarterbacks by the team statistic of wins and losses is stupid, but judging them by playoff wins and losses is even more stupid, and it’s particularly so with Romo. There have been multiple strong cases made this week that Romo’s stats (many of which came during years where he didn’t have a lot of help) make him one of the most underrated players ever. But sure, Stephen A., playoff record is all that matters. Usually, how to maximize the No. 1 pick is the pivotal call of a team in this position. But it has been reduced to almost an afterthought because it most assuredly does not involve a quarterback. It’s easy, right? Use the No. 1 pick on pass rusher Myles Garrett and then go to work on the tougher challenges. At least it seemed simple, until Bill Barnwell struck again. Analytics-R-Us: Barnwell is a staff writer for ESPN.com, steeped in analytics, one of the many speakers at the annual MIT Sloan Sports Analytics Conference, which was held in Boston last month. His biography on the conference Website includes the tidbit that Barnwell “has served as a quantitative consultant to both MLB and NFL teams.” Although there is no mention that Barnwell has served as a consultant to the Browns, the circumstantial evidence is that he has, or does. After all, Barnwell, who speaks the language of the Browns’ current regime, using terms like Pythagorean triangulation and Defense-adjusted Value Over Average (DVOA) systems, apparently was the one who first conceptualized the idea of the NBA-like, salary-dump trade for Houston Texans quarterback bust Brock Osweiler. In a Dec. 22 column on ESPN.com, Barnwell proposed the Browns take on Osweiler’s $16 million salary as a means of accelerating their rebuilding project. If the Browns do not employ Barnwell as a consultant, they certainly read him and respect him. For on March 9, they shocked the sporting world – except for Barnwell – by doing what he recommended 2 ½ months earlier. Well, almost exactly what he recommended. …It’s not unfair to speculate that the concept originated with Barnwell. Which would mean the Browns are outsourcing major decisions to a football analytics columnist and podcaster with no practical experience in football scouting, coaching or team-building. First of all, it seems that Grossi means Pythagorean expectation (“Pythagorean triangulation” would be more suited for a high school trigonometry class), but beyond that, his analytics-bashing and Barnwell-bashing here is just hilarious. And “outsourcing major decisions to a football analytics columnist” is something not supported by the evidence. Perhaps the Browns made the Osweiler trade just because it was a good way to use cap space and gain draft picks? Also, just because Barnwell was smart enough to envision that before it happened (and Grossi wasn’t), that doesn’t mean that the team’s turned over decision-making to him. Grossi then goes on to grossly oversimplify the call the Browns have to make here. Drafting Garrett is far from a sure recipe for success (some highly-drafted pass-rushers have turned out great, but many haven’t), and there are plenty of other plausible options for the team. But sure, it’s just those nasty analytics complicating a call they should make on their gut without any evidence. Good argument. @mikeparry8 So because he's the current James Bond he has to stop supporting the team he's supported all his life ?? Notable absences: Shannon Sharpe, JT The Brick, Colin Cowherd.